Yes, I'm back. Nice to have a little break. Miss me? So why am I jumping out of a cake? (and more importantly, why isn't it a stripper?) 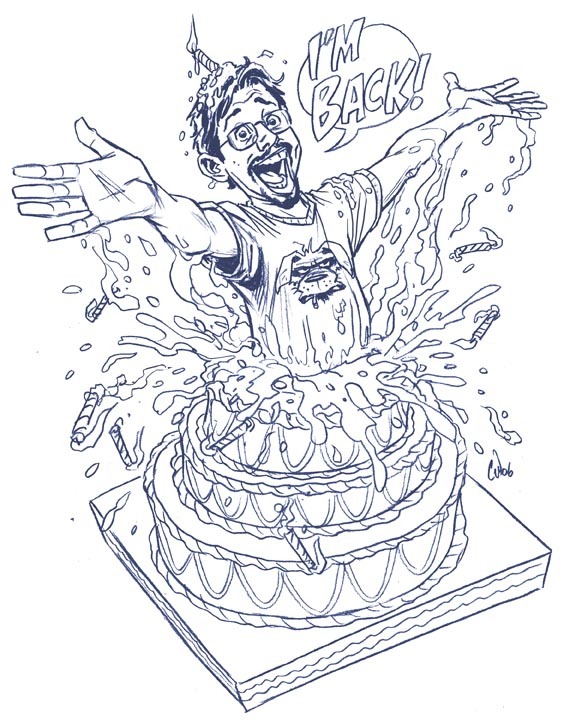 This week's Illustration Friday topic is 'cake' so it seemed appropriate. It's back to the grindstone for me. Be sure to pop in for regular blog updates. Welcome back Chris- it will be nice to be able to see your work on a regular basis again! My morning routine consists of checking out several artists blogs to get the inspirational gears in motion. 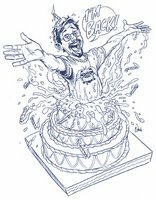 Nice cake illo too- I have been slackin' in the Illustration Friday department, need to get back into those! This is great! You're a super draftsman. ah! finally! your back. LOL and this drawing is hilarious! Thanks everyone for the warm welcome back. Heri- I'm eager to do the video...so it'll be coming very soon. Great! I will be waiting.